So after using a shiny new MacBook Pro for a week, I've found something I don't like about it. This also applies to the MacBook, since I've tried my wife's MacBook out and it has the same design flaw. The screen does not tilt back far enough. 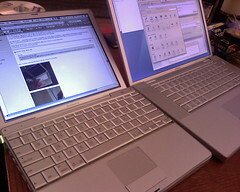 I know this because my old school twelve inch Powerbook G4 tilts back a little further. Which is something is nice to have when you're stretched out on the couch half slouched, half laying down and you wanna prop your laptop on your half propped up leg and type, not so easy. Why did Apple shorten the throw/tilt of the new macbooks? Give me back more tilt! First thing that gets me is 2 fold. One, I'll reserve my judgement on. Touchscreens, ok, I'm reserving my judgement on the multi-touch system, but people, myself included want to have tactile feeling when we're pushing buttons. You can't include that in a touch screen unless Apple figures out how to create some elecatrostatic-polymorphic plastic that can morph into buttons based on what's onscreen. Which brings me to my second point. 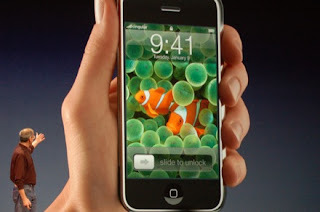 Watching Steve Jobs give all his demos on the keynote, everything needs to be done with two hands. This goes against two principles of the iPods itself, and how most people use phones. They like to use it by using one hand. No one wants to walk around face buried in their iPhone and walk right into something because they had to concentrate using their phone. Also the same reason why Apple had originally had their iPods be completely touch sensitive in their third generation iPod only to "back pedal" and throw the click back into the click-wheels of the fourth gen iPod and on...til now. Also, screens. Screens are prone to smudge and scratching. Ask anybody that bought a PSP, or even an iPod. Unless Apple was smart enough to acquire this, I smell another class-action lawsuit about people bitching how their iPhone isn't working up to their unattainable expectations. As for them touting internet browsing. It seems like a nice idea but do I really want to treat a web page like a map where i need to crawl around the page to read snippets about it? I like Opera's approach of screen optimization. After all, mobile browsing should be simple. And the way Apple has approached it seems more of a pain than simplicity. So, seeing how I'm not willing to switch and pay the price of breaking my T-mobile contract and probably pay twice more for the same type of phone/data service on Cingular, I'll just have to wait for an unlocked version in 2008. 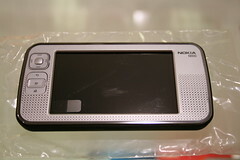 The new Nokia N800 Internet Tablet is on the verge of getting introduced. I more or less love my Nokia 770 Internet Tablet, so I'm wondering what bump in speed or memory is under the hood. The only thing I wish my tablet could do better was to be able to view flash video a la youtube/google video and also be able to handle embedded video in Windows Media and Quicktime format. Which got me thinking, the upcoming week is gonna be big in the tech world, seeing how both the Consumer Electronic Show is busting open their doors in Vegas while Apple is gonna have another Steve Jobs keynote at Macworld. Everyone is clamouring the next big gagdet, of which 90% or so will have to do with something about looking at a screen. Be it a smartphone, a video display that outputs 1080p clarity, a fancy tablet, etc. And it got me thinking, is our world so dull that we need to distract ourselves with windows into virtual/fantasy worlds? Is technology and capitalism just creating a new paradigm of Plato's Cave? Is reality that harsh that we have to cling onto our techno security blankets? Maybe. After all, I have a love/hate relationship with this stuff. It excites and frustrates me at the same time. Will I be still shelling my money over for the toys that are introduced next week? Probably. Will I resent myself a bit because I could've spent the money a bit better by either traveling or paying of my debts? Maybe. I guess only time will tell. Although, most of the time, I know sinking my money into technology is sort of like drugs. They get me high for a bit, but ultimately, I'm looking for a stronger high, a bigger fix. And ultimately, I might just be a bit poorer for running in this vicious cycle.